Is a Chainsaw Mill Right for You? Chainsaw mills are small sawmills designed to be used by just one or two operators to mill logs into lumber. Chainsaw mills were invented to cut lumber in very remote regions such as the Alaskan wilderness. There are several types of chainsaw mills. A very basic type consists of a steel guide bracket that mounts to the chainsaw bar and follows a straight edge. More elaborate chainsaw mills consist of a track and frame system to which the chainsaw is mounted. These are similar to portable band sawmills. 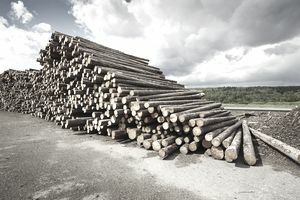 Production is limited on a chainsaw mill—it is not a machine that is designed to produce stacks upon stacks of lumber. On the other hand, if you want to make a few boards and have no way of doing it, a chainsaw mill can be the difference between wasted logs and usable lumber. A saw kerf is the thickness of the slot cut by the saw. A chainsaw has a saw kerf right around 3/8 of an inch, which means it is very inefficient and produces a lot of sawdust. For these reasons, a chainsaw mill is definitely not to be used for optimizing the amount of lumber that you can yield from a log. What's more, that large kerf means that it takes a lot of time and energy to cut your lumber with a chainsaw mill. You are only limited by the length of your longest chainsaw bar. As long as your bar will reach across the log then you can cut it into lumber. A chainsaw mill is a great machine for cutting wide slabs out of large trees. If you're planning, for example, to build tables that have a single slab top, this could be the saw for you. What if you have a portable sawmill with limited cutting capacities? You could add a chainsaw mill to your arsenal and use it to cut larger logs down to a manageable size, then you can fit the smaller log onto your higher production portable sawmill. Anywhere you can go on your own two feet you can take a chainsaw mill with you. Do you need to build a log cabin deep in the wilderness? This is the sawmill for you. You can pack one of these sawmills in a bush plane or helicopter and take it with you where roads don't go. Even better, you can cut your logs wherever they lie. This is a sawmill for the super small budget. Keep in mind if you don't already have one, you will have to buy at least a mid-sized chainsaw to power it. A large professional grade saw will work the best. Is a Timberking Sawmill Worth the Cost?